A yurt is a portable, circular structure traditionally used by nomads in the steppes of Central Asia, dating back to the 12th century. The traditional yurt cover was felt, made by beating and rolling wet sheep fleece. The walls were low, made from poles, and the whole structure could be taken down and hauled by ox-cart. The yurt (ger) is still home to a large portion of the population in present day Mongolia. Modern yurts take advantage of advances in materials and construction methods and are much more robust than their traditional counterparts. 2How large are the yurts that Blue Ridge Yurts manufacture? We make yurts in four diameters, 16', 20', 24' and 30'. All of our yurts have 7'4" tall walls. We also make yurts with 24' and 30' diameters that have 10' walls. 3Can I look at a yurt that was made by Blue Ridge Yurts? Yes. We have a 20' display yurt that is available for viewing during our business hours. We also have a 30' demo yurt with 10' walls that has a loft area with beds, a full kitchen and bath, a private bedroom, and a living area that is available for rent (Floyd Yurt Lodging). Depending on availability, we can arrange a tour of the demo yurt for you as well. Please call us at 540-745-7458 or email info@blueridgeyurts.com to arrange to view our yurts. We would love to speak with you! 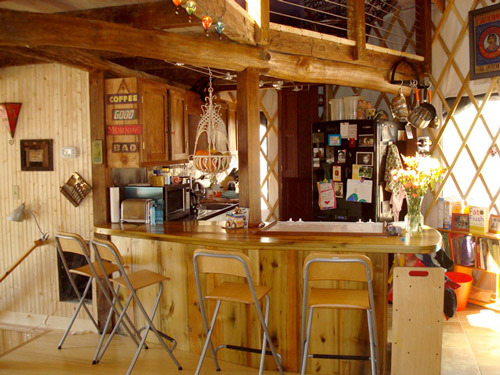 4I would like to visit Blue Ridge Yurts in person, where are you located? We're located in the heart of the Blue Ridge Mountains, in the beautiful town of Floyd, Virginia. 5Who will set the yurt up? Our yurts are designed to be easily assembled by you. We have clear assembly instructions, which should be studied ahead of time. A yurt-raising is a good occasion to call in friends and/or family, especially for the larger size yurts. A 16' yurt can be put up by two people in an afternoon. A 30' yurt may take a weekend. We also maintain an experienced team of individuals who can deliver and help oversee the setup of your yurt. Call or email for a quote. 6Can I get a permit from the building department to build my yurt? More and more people are opting for yurts as their permanent residences. Our yurts also make a perfect vacation home, at a cost much less than building a cabin. They are a good option for a living space while building a more permanent shelter. 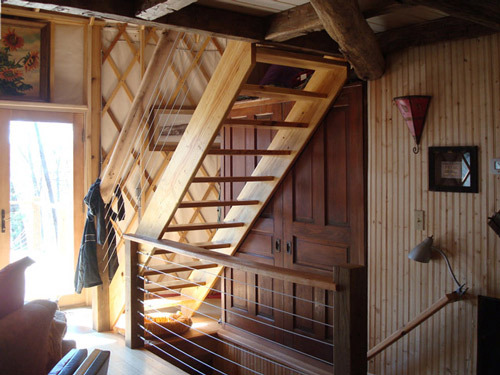 When the house is finished, the yurt can become an office, guest room, or studio. Whatever your usage plans, depending on where you live in the country, you may need a building permit. Areas vary widely in how their county officials view yurts. Where your site is, what size yurt, how it will be used, whether it is considered temporary, permanent, or semi-permanent, will be considerations in whether or not a permit will be required. A yurt is sometimes classified as an "auxiliary structure" instead of a full-time dwelling. If your intention is to make your yurt a full-time residence, you may need independently engineered drawings stamped in your state. We have stamped drawings for several states and can assist in this. 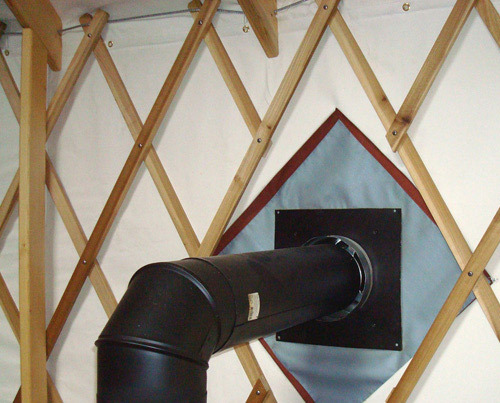 The main issue with yurts and the building code is with insulation and meeting the minimum compliance requirements. Currently, many building officials will permit a yurt provided it uses a renewable heat source. Click here to read the determination by the Virginia Housing Department regarding yurts. The issue yurts have of meeting energy compliance directly relates to the insulation. We are in the process of upgrading to a newer product with a higher R-value. The insulation we currently use in the walls and roofs is NASA-engineered foil insulation rated R7. County building officials recognize the results of REScheck, an easy to use planning tool for meeting energy codes which you can fill out yourself and show your county inspector. If you will be installing electricity and plumbing you will need permits from the appropriate officials. You may need a building permit for your deck or platform. 7What does my yurt sit on? 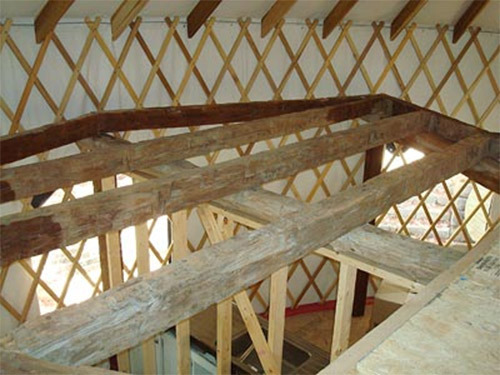 A yurt needs to be set several inches above a deck or the ground and on a round platform the same diameter as the yurt. This is necessary so the walls can be tucked under the flooring for a secure, wind-proof, installation where water can run off onto the ground beneath. We have construction plans for a round deck with the platform in the center, and also for a square deck with the platform framed on top of the deck framing. You can download our engineered them on the Ordering page of our website. Our deck plans are specifically designed for yurts, and will meet the approval of any building department, as you will need a building permit, in most cases, for your yurt deck. You are responsible for building your own deck, or working with a contractor in your area. Within a 100m radius of Floyd, VA, we do have qualified deck builders on offer; email info@blueridgeyurts.com for an estimate. 8Can I add plumbing and electricity to my yurt? 9How do you heat and cool a yurt? You could heat your yurt in any manner that you would a conventional building: radiant floor heat, wood or propane stove, electric, or solar. Our foil insulation reflects whatever heat you generate back into the room. You can opt to have insulation panels that insert into your window flaps. Insulating your floor when you build your platform, adding window insulation, together with your wall and ceiling insulation, should keep you toasty on the coldest days. It is easier to stay warm in a yurt than it is to stay cool in one. Yurts placed in treed areas will stay cooler than those in a completely open space. In a very warm location, you may want to consider a cupola, instead of a dome. A tinted dome option eliminates a lot of the UV rays. Our window flaps can double as awnings over the windows, which, especially if you put insulation in the flap pockets, would keep the heat at bay. Venting the dome allows the hot air to escape. Planning your window locations to get cross breezes helps a lot, as does add a screen door. A ceiling fan can keep the summer air stirred as well as circulate and push the warm air back down in the winter. It can be hung either under your center ring or placed off-center between rafters, which allows easier access to your dome. An air conditioner is also possible. 10What kind of maintenance is involved with a yurt? You can wash the outside of your yurt with warm water and dish soap. Do not use a power washer. Keep leaves and debris cleaned off of the roof. To clean your dome and windows first brush off any debris, which can scratch the surfaces, then wash with a soft cloth (do not use paper towels or newspaper), mild soap and water, then rinse. 11My yurt will be in a windy location. Should I worry about wind damage? Our yurts are engineered to withstand a minimum of 90 mph winds, without any interior supports. We have modifications to meet 140 mph winds. Our standard yurt package contains vertical supports that can be added under half of the rafters, providing additional stability. We also recommend putting a hook and latch on the outside of your door and hooking it when you are gone, as very strong winds can twist the frame enough that the door may blow open, which could cause trouble. Periodically, you should check that the bottom cable on your yurt is still tight up under the floor. This cable is your main insurance against wind ripping your walls. 12Should I worry about snow load? You need to check with your county building inspector to see what the load requirements are in your area. Our yurts are engineered for 40 psf (pounds per square foot) without any additional supports. Vertical support under every rafter would increase this psf, as would opting for our heavier-duty roof fabric. 13Can two or three people without much carpentry experience put up a yurt? The platform that the yurt sets on can be challenging if you don't have much experience. You may need to hire someone to build your deck and/or round platform. We try to make our yurt assembly instructions very clear. The hardest part is hanging the door, as it is heavy and awkward. The roof material, particularly on the larger yurts, is extremely heavy, and the roof installation portion requires extra hands. Yurts are designed to go up within half a day; if you don't feel confident about erecting your own, we do offer set-up assistance. Please email info@blueridgeyurts.com for a quote. 14Can I make separate rooms inside my yurt? Yes you can. You can divide off an area using movable partitions or curtains, or you can build interior partitions with lumber. It is efficient for plumbing if a bath partition wall is shared with a kitchen. Partitions are added after the yurt is up. They should not be attached to the rafters. They are attached at the floor and can be secured to your lattice wall or your vertical supports. They can have ceilings or be open at the top to share light from the central dome. 15Will there be room to have a loft in my yurt? Your walls are 7’4" tall and your roof rises 7” per each foot of run. In all size yurts, lofts can provide good storage space and extra sleeping space, especially for little people. A loft will be 5’10” at 10’ out from your wall. So on the 24’ and 30’ yurts, you could have a loft that you can stand up in. If you purchase a 24' or 30' yurt with 10' walls, you'll have more than enough space to build a loft in your yurt. 16Do I have to come pick up my yurt or do you offer delivery? Either option is possible. Floyd is located in Southwestern Virginia, not far off I-81 and fairly close to I-77; we are within a day's drive to most of the eastern states. Alternatively, we offer delivery service for $1.50/mile plus hourly for our driver and a per-diem travel fee. Email info@blueridgeyurts.com for a quote.